A Psalm on Scripture’s Sufficiency, Psalm 19:7–9, is the most monumental and concise statement on the sufficiency of Scripture ever made. Penned by David under the inspiration of the Holy Spirit, these three verses offer unwavering testimony from God Himself about the sufficiency of His Word for every situation and thereby counter the teaching of those who believe that God’s Word must be augmented with truth gleaned from modern psychology. In this passage David makes six statements, each highlighting a characteristic of Scripture and describing its effect in the life of the one who embraces it. 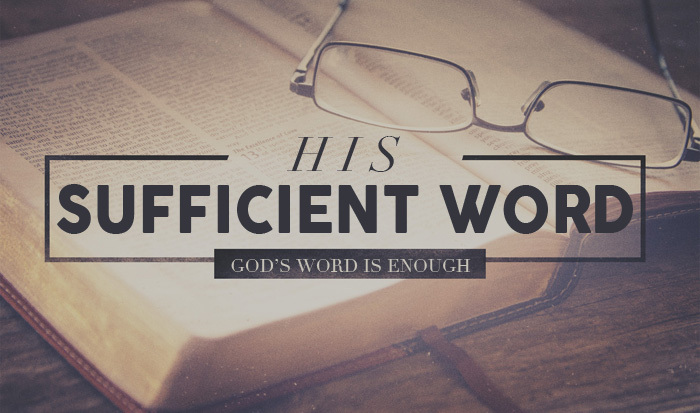 Taken together, these statements paint a beautiful picture of the sufficiency of God’s Word. Scripture Is Perfect, Restoring the Soul: In the first statement (v. 7), David says, “The law of the Lord is perfect, restoring the soul.” This word “perfect” is the translation of a common Hebrew word meaning “whole,” “complete,” or “sufficient.” It conveys the idea of something that is comprehensive, so as to cover all aspects of an issue. Scripture is comprehensive, embodying all that is necessary to one’s spiritual life. David’s implied contrast here is with the imperfect, insufficient, flawed reasoning of men. Scripture Is Trustworthy, Imparting Wisdom: David further expands the sweep of scriptural sufficiency in Psalm 19:7, writing, “The testimony of the Lord is sure, making wise the simple.” David’s use of the word “sure” means that the Lord’s testimony is unwavering, immovable, unmistakable, reliable, and worthy to be trusted. It provides a foundation on which to build one’s life and eternal destiny. Scripture Is Right, Causing Joy: In verse 8, David adds a third statement about Scripture’s sufficiency: “The precepts of the Lord are right, rejoicing the heart.” Rather than simply indicating what is right as opposed to wrong, the word translated “right” has the sense of showing someone the true path. The truths of Scripture lay out the proper path through the difficult maze of life. That brings a wonderful confidence. So many people are distressed or despondent because they lack direction and purpose, and most of them seek answers from the wrong sources. God’s Word not only provides the light to our path (Ps. 119:105), but also sets the route before us. Scripture Is Pure, Enlightening the Eyes: Psalm 19:8 gives a fourth characteristic of Scripture’s utter sufficiency: “The commandment of the Lord is pure, enlightening the eyes.” This word “pure” could better be translated “clear” or “lucid,” and it indicates that Scripture is not mystifying, confusing, or puzzling. God’s Word reveals truth to make the dark things light, bringing eternity into bright focus. Granted, there are things in Scripture that are hard to understand (2 Pet. 3:16), but taken as a whole, the Bible is not a bewildering book. It is clear and lucid. Scripture Is Clean, Enduring Forever: In Psalm 19:9 David uses the term “fear” as a synonym for God’s Word: “The fear of the Lord is clean, enduring forever.” This “fear” speaks of the reverential awe for God that compels believers to worship Him. Scripture, in this sense, is the divine manual on how to worship the Lord. The Hebrew word “clean” speaks of the absence of impurity, filthiness, defilement, or imperfection. Scripture is without sin, evil, corruption, or error. The truth it conveys is therefore absolutely undefiled and without blemish. Scripture Is True, Altogether Righteous: Verse 9 provides the final characteristic and effect of God’s all-sufficient Word: “The judgments of the Lord are true; they are righteous altogether.” The word “judgments” in this context refers to ordinances or divine verdicts from the bench of the Supreme Judge of the earth. The Bible is God’s standard for judging the life and eternal destiny of every person. Because Scripture is true, it is “righteous altogether” (Ps. 19:9). The implication of that phrase is that its truthfulness produces a comprehensive righteousness in those who accept it.